German sports giant Adidas has a number of accessories available for smartphone owners, with its miCoach software running alongside, to better track, analyse and map fitness sessions, and identify ways for athletes and amateur fitness enthusiasts to improve their regimes and become better runners. Last week, Adidas finally launched a project that had been years in development; SPEED_CELL. Tailored specifically to football (the soccer veriety), and with backing from players Lionel Messi, Dani Alves and Gareth Bale, Adidas looks to bring professional-grade fitness analytics to the general football-playing consumer, helping them adapt and improve their game by better understanding how their fitness impacts it. 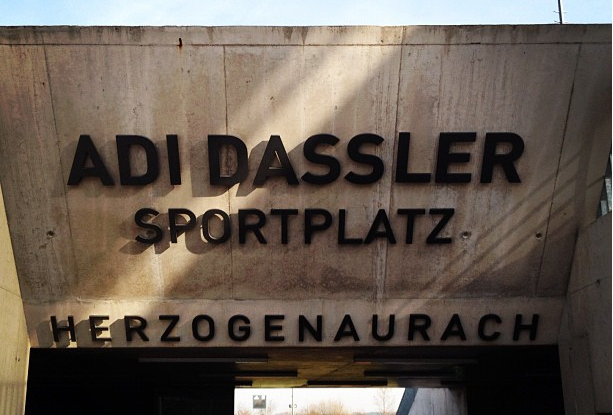 Adidas flew us out to its HQ in Herzogenaurach, Germany to test its new adizero F50 football boots, run through our performance and play with the new miCoach Football app; a new iOS application that downloads, collates and allows you to share analytics from up to 20 of your past football matches or training sessions at any given time. We want to make athletes better, helping to coach them via a guided workout. By using our specifically created sporting portal, miCoach.com, our devices (Pacer, Speed_Cell) we want to turn potential into results and make people faster, stronger and smarter. 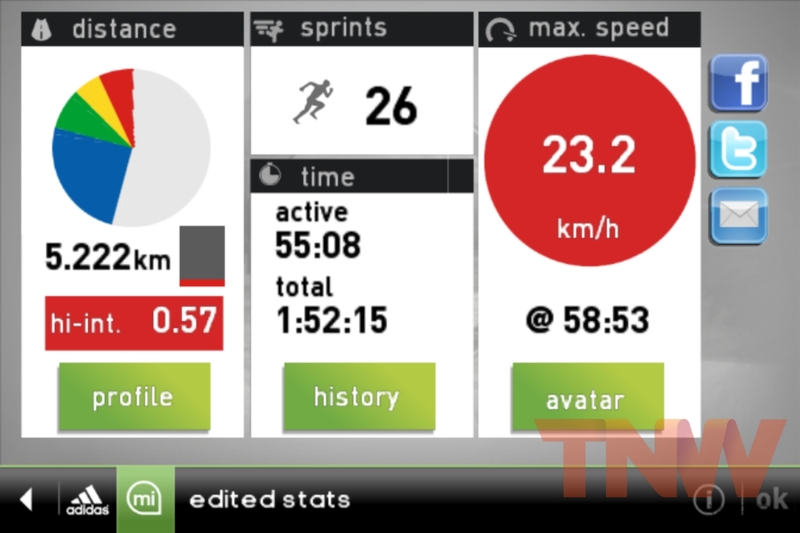 Before the launch of the Speed_Cell, Adidas designed and built miCoach.com, a social network for users of its existing sports gadgets, allowing them to upload statistics from their runs and receive uniquely tailored tips and suggestions on how to improve their performance based on the data. 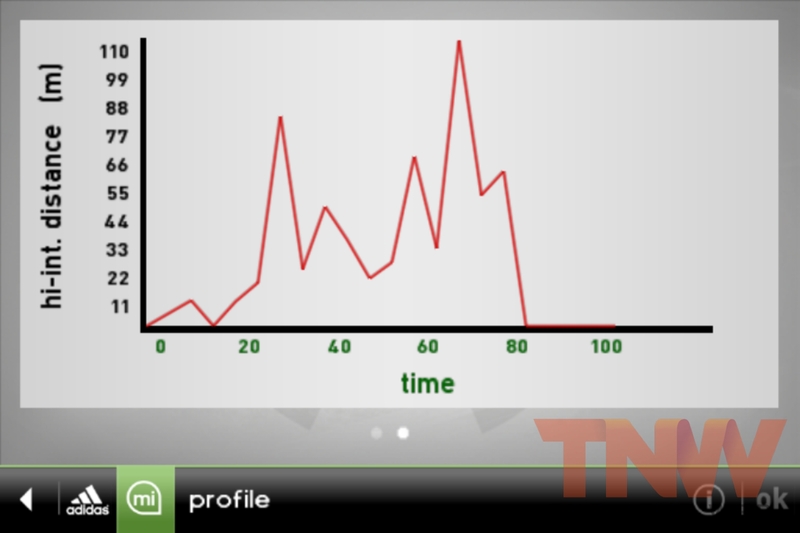 As it stands, the miCoach.com website has 600,000 users with over 224,000 active users. The new Speed_Cell sits directly within Adidas’ miCoach brand, connecting to the miCoach service, much the same as its Pacer accessory. 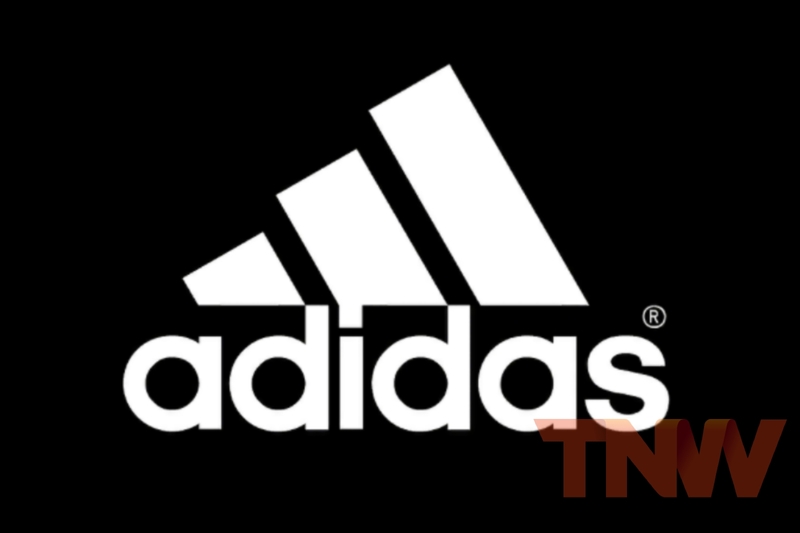 Whilst it is specifically aimed at football players, Adidas has said it is already working to outfit a number of its running shoe ranges with the same cavity, to enable athletes and runners to utilise the technology in the future. 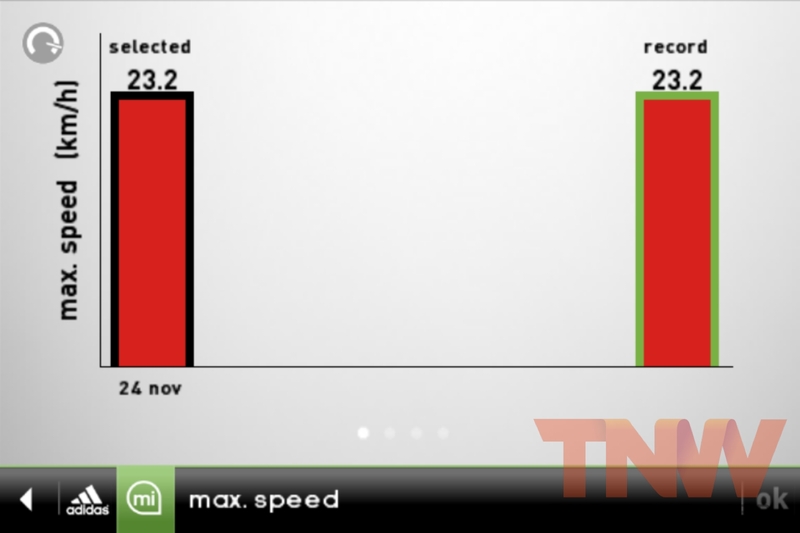 Beyond that, basketball and tennis players can expect the Speed_Cell to be optimised for their sport. Available in the UK from last Wednesday, you might recognise the new adizero F50 boot – it’s currently worn by Lionel Messi and a large number of footballers playing in the Premier League. 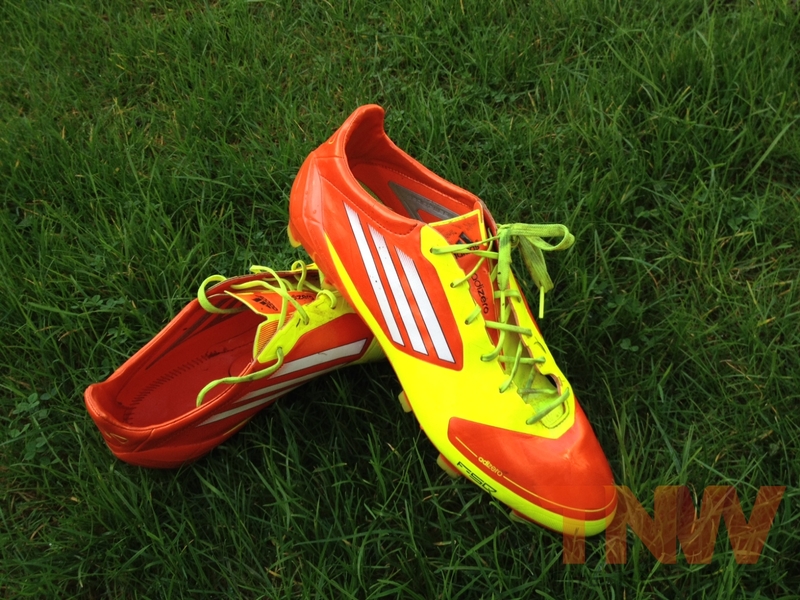 Launching in a very bright and obvious yellow and orange colour, the new F50’s are extremely light on the foot, almost slipper-like when worn, ensuring you are as quick across the ground as possible but also that the opposition’s centre-back can earmark you for a heavy challenge during your next Sunday league football match. On the bottom of the boot, you will notice a small compartment moulded between the studs. This small cavity is accessible underneath the sole, providing a snug fit for Adidas’ new miCoach Speed_Cell accessory. The accessory sits flush in the boot, allowing the inner sole to lay directly over it and not impact the wearer in any way. Adidas has also bundled a small clip that can be attached to the laces of a boot, allowing owners of other brands of football boots to attach their Speed_Cell and still analyse their performance. Adidas refers to the adizero f50 boot as its groundbreaking ‘football boot with a brain’, bringing ‘smart technology to the field of play’. 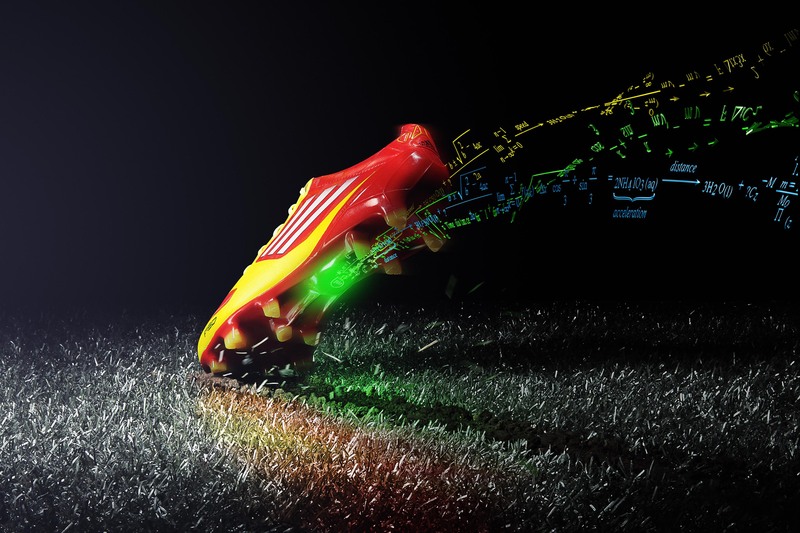 Obviously, by wearing the boot you will be doing the hard work – it’s the miCoach Speed_Cell that crunches the data, helping to identify specific parts of your game that might need improving. Slipping the Speed_Cell into the boot, you are good to go. It is designed to store up to 50 unique workouts. The chip uses intelligent sensors to detect when the user is performing their activity (so you don’t have to worry about it capturing your drive to work when you have your boots in the car). The accessory is capable of capturing 360° movement and measuring key performance metrics including speed, average speed, maximum speed, number of sprints, distance, distance at high intensity levels, steps and stride rates. With Ant+ radio support, users don’t even need to take off their football boots to be able to download their data, in fact in our tests we were able to synchronise just seconds after a football workout from a distance of around 4 metres. To sync a workout to an iOS device, users are required to attach the iOS dongle to the charging port on their iPhone or iPod Touch, move the sensor in range and then sync it to the miCoach Football application. 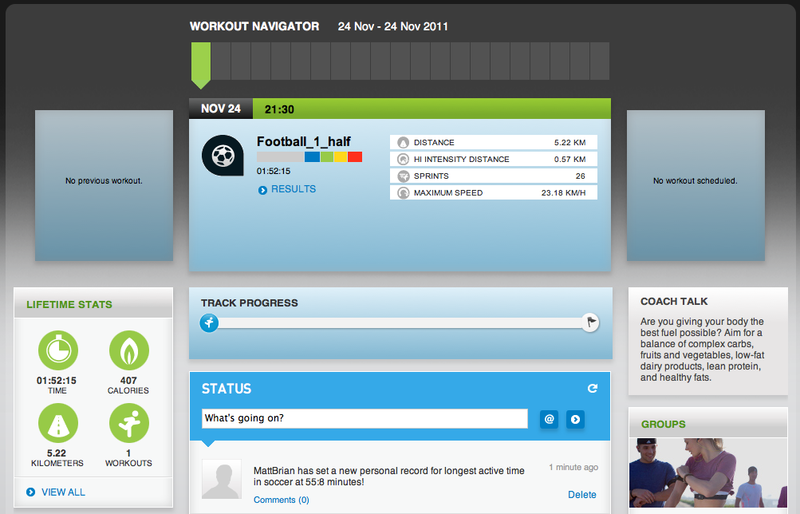 The Adidas miCoach Football app collects and visualises the data, providing users with the opportunity to share their stats via Twitter, Facebook, email or via the miCoach.com website. Data can then be analysed and compared with the performance of friends on the service, but also with some of the top football players in the world. Tottenham’s Welsh left-winger Gareth Bale has agreed to make data from his matches available, for example. 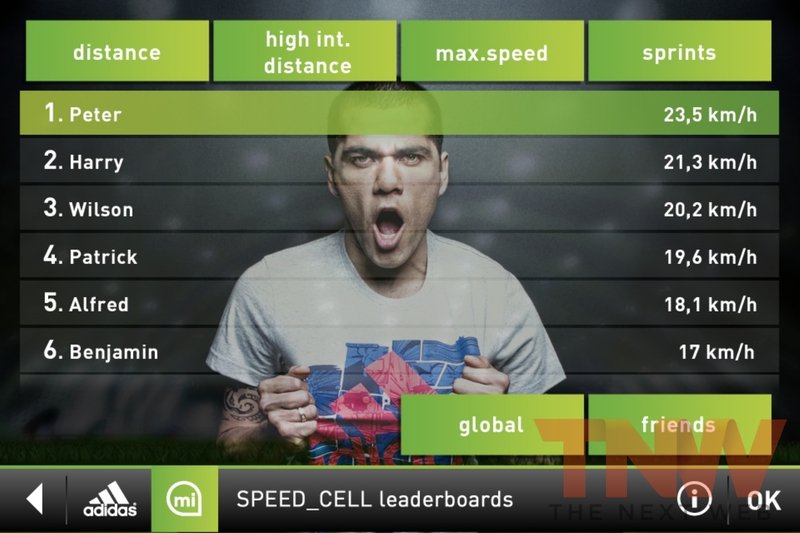 The app also builds in a football mini-game that directly correlates with the owner of the Speed_Cell. As workouts are synced with the application, improvements unlock in-game achievements and bonuses which can boost the performance of your team within the football game. Don’t expect FIFA-like gameplay but it’s is still impressive enough on its own for some users to be able to play without using the Speed_Cell accessory. We took the adizero F50 football boots and the new Speed_Cell through a training match, a moderately energetic game of football specifically designed to give us a good look at how our performance would be monitored in a small environment. As you can see, we played for around two hours, of which 55 minutes were active. During this time, we were tracked over a distance of 5.22 kilometres, with just 570 metres of high intensity work (which are constitute sprints or long periods of high speed running). The beauty in Adidas’ approach is that as you work out, it continues to monitor your data and suggests ways you could improve. 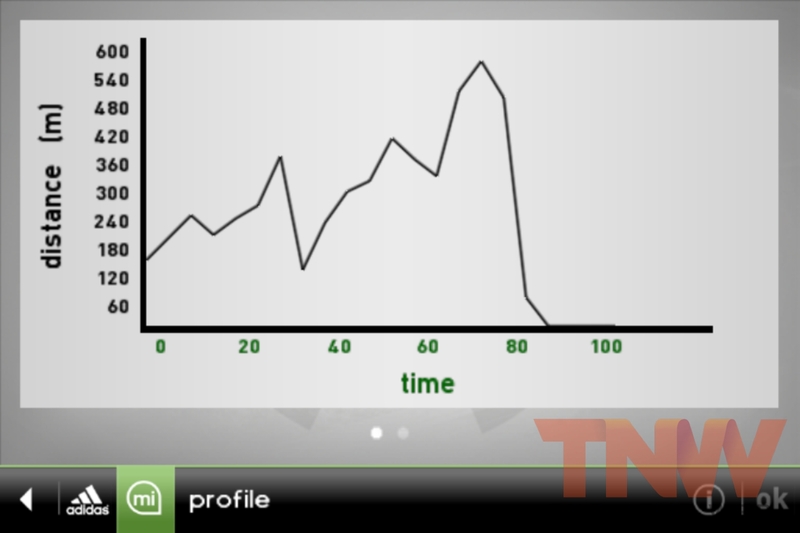 A football player may track their performance over a typical 90 minute match and notice that as they continued to play, their intensity declined over the last 15 minutes of the match. 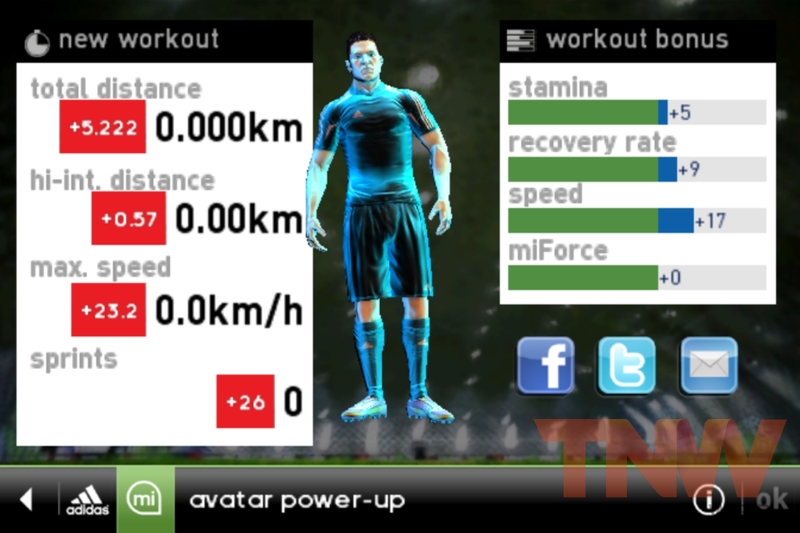 Armed with that knowledge, the player is able to tune a training routine to assist him/her with fitness techniques that increase stamina, working specifically to boost that part of their game. With the application identifying high-intensity work, the player may also identify that they were not working at their optimum for long periods of the match, motivating them to pick up their work rate. However, it’s not all up to the player. Adidas’ miCoach community brings together thousands of likeminded individuals that want to find ways to boost performance. By sharing workouts, graphs and different elements of their own performances, users can work with the miCoach community and dedicated Adidas representatives to find ways to improve different parts of their game. Integration with Apple’s GameCenter helps increase competitiveness between friends in real life and those online. Adidas’ app isn’t perfect; it isn’t yet compatible with the iPad and a lot of options are buried in multiple menus. That said, the associated football game within the app does bring a sense of fun to the workouts, knowing that you will be able to boost the players by increasing your own performance statistics and also unlock in-game elements. 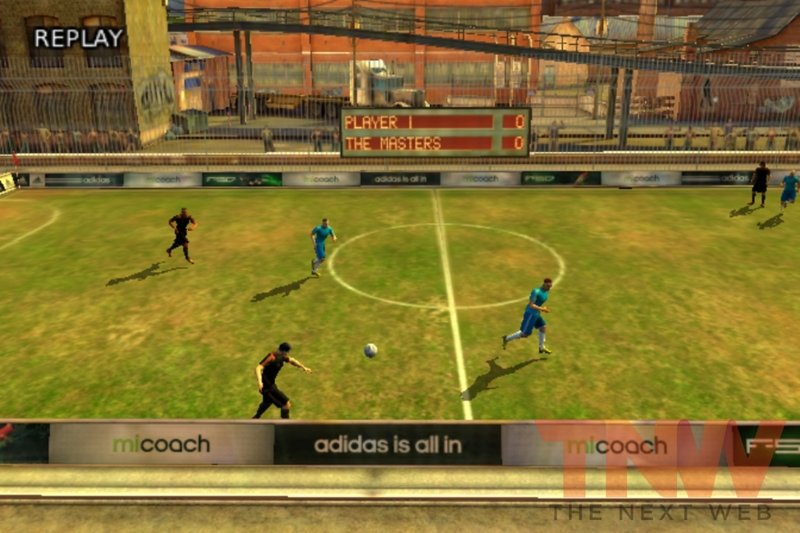 In the future, Adidas hopes to build out the app to include multiplayer matches, developing systems to utilise Apple’s GameCenter leaderboards, integrating more workouts into both the miCoach and miCoach Football app to increase the number of training techniques that can improve performance without being specific to a sport. Adidas is also working to make a lot of its Flash-based website HTML5-accessible so that it can display more data on mobile devices. If you’re a football player that can’t stand pounding the streets with boring runs, Adidas’ Speed_Cell chip is right up your street. 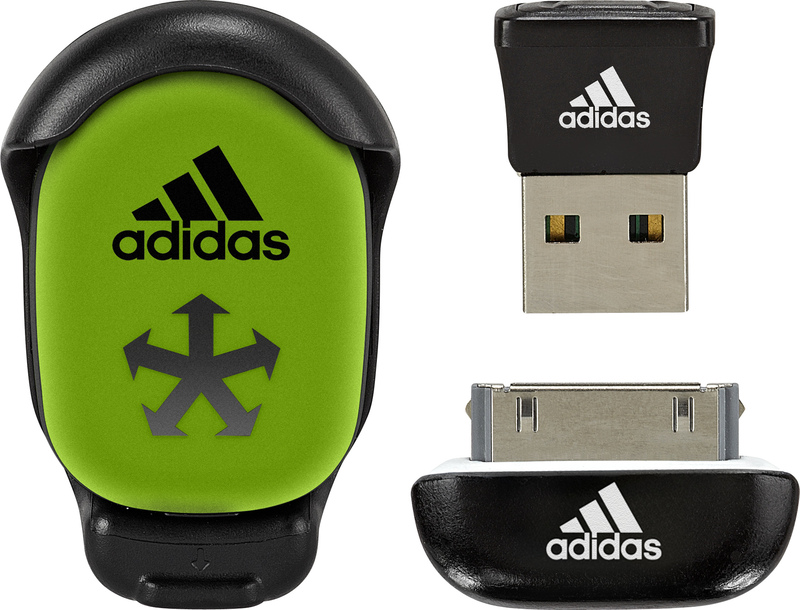 With a greater number of features than Nike’s technology, Adidas is hoping that the boom in smartphone use will drive demand for its powerful little chip, but with PC and Mac capabilities this great little tool can be used wherever you go. If you are in the market for a new pair of boots and want to try the Speed_Cell out for size, they don’t come cheap. However, you are able to buy the boots or the Speed_Cell individually if you want to be able to use the technology in your own pair of boots, or want to use the boots and perhaps buy the tracker a little later down the line. Together, the adizero F50 and Speed_Cell package has an RRP of €245 but can be picked up in the UK for £199.99 in a number of different colours. On it’s own, the Speed_Cell will set you back around £70.